Want to join me in A Thousand Words Thursday, read and grab my button from HERE. Then write in your name and the URL(permalink) in Mr. Linky below. MR LINKY IS WORKING...CLICK BELOW AND OPEN A 2nd WINDOW TO LEAVE YOUR LINK! So glad you caught that moment on camera -- priceless! How cool! 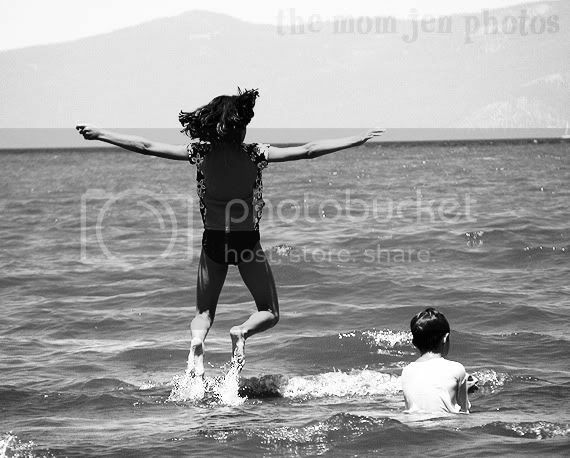 It looks like she's jumping right out of the water. Can you delete my first one...it automatically pops up and I hit enter before I had changed it! SORRY! Beautiful capture. Love the color...or lack there of! That is a VERY AWESOME capture! great shot jen, yes there is something about being away that is so relaxing! aww love this photo! I love vacation photos.. they are always so relaxed! Did you really twist your ankle AND throw out your back?? Yikes. That is the coolest picture Jen! Like she is walking on water. Ah...I SO need a vacation...great capture! That is a very cool shot, great capture on the action! That looks like so much fun! Seriously, so happy! Great picture. Love the in air capture above the water! what a great shot! pure joy...that's the best! Great photo, almost looks like she's floating in midair. If only we could have that carefree vacation state of mind everyday. What perfect timing for that picture! Awesome picuture - really magical! Ah... the joys of childhood! What an awesome picture. Amazing scenery too. Where was this picture taken? Just linked to Mr. Linky today for the first time. 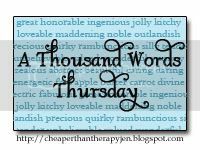 I have always enjoyed other bloggers' A Thousand Words Thursday entries and commented, but never participated. I have seen some folks post videos and that is what I did today. I hope that is okay. My son's enjoyment speaks volumes for me. Have a wonderful day and take care. I look forward to next week. What a great picture! How funny is it that our choice for ATWT are so similar? I guess ATWT in July just screams for pictures of jumping in water! Your "moment" is timed much better than mine! Yes he is wearing a little backpack that his aunt and uncle got for him from this little boutique. It is so cute and has monkeys on it with a banana zipper pull. He loves it still and uses it to carry toys around. Great shot! Even with all your aliments. How fun is this picture! I love it! Great picture. How did she jump out of the water like that? That is a really awesome picture.